The technology also ensures that the server is constantly synchronized with the client machine. A weighted crawling technology is used to crawl the files on the system for changes that need to be updated on the server backup. The Turbo upload feature allows files to be transferred even as they work on them. The backup process is automatic once the client application has been downloaded and installed on the system. The backups will begin on schedule and the client program will automatically monitor the bandwidth of the Internet connection and the CPU available for backup through an auto throttling system. However, for those who want to manually override the client application, the interface allows users to specify how much of bandwidth they want to dedicate for the backup and how much for other purposes. Large files (4GB+) are segmented for file transfer to allow for modular use of available bandwidth and automatically reconstructed at the server end. Memopal, cloud-based online backup system, also enables the storing of 1 billion files with file path mirroring and encryption protocols. Strong 128 bit encryption protocols are used to encrypt data that is being transmitted from the client to the server via a secure Internet connection. The data is also stored with a 448 blowfish encryption protocol that makes for high security. Protection against malfunction, human error or data theft is a fetish with the company. The popularity of the online backup application is testified to, by the number of subscribers that have entrusted their data to Memopal since it launched its online data backup service in 2007. Access to files is simplified with two cloud access methods. The DAV improves the user’s interaction with saved files. The web based file manager system offers advanced preview, sharing and download functions. The newly introduced file cloud search system on the web interface provides access to files without having to specify the path to the file. The result ranking techniques are sophisticated and rank the users most important files first. The algorithm is based on a few simple principles that give priority to important file extensions that are calculated according to a monthly statistical index the user has created, by highlighting the most frequently used files and the level of proximity of the file to the storage path. The intuitive and immediate search result display system shows the image and video document previews and creates shortcuts for favorite files. Files can be found in less than 50 milliseconds. The file service is configured as a cloud sharing service to facilitate email systems with large attachments by transforming files to be shared as links that can be accessed from the Internet with expiration dates and access controls. Up to ten computers can be connected with a single personal license. The future Memopal services could well include cloud sync wherein different files from a number of personal computers can be synchronized through a backup set that users can build over a period of time. Several new functionalities are on the anvil for those who are looking forward to advances in the online backup technology as served up by Memopal. Memopal comes in three flavors -Personal, Business and Enterprise. The Personal minimum configuration for one year, one computer and 150 GB of space is priced at US $49, while the Business minimum configuration for one year, one computer/server with 10 GB of space is priced at US $49. Enterprise hosts 50 TB of space and pricing is available on contact with the company. A seven-day trial version can be downloaded, by those who want to try before they buy. In addition to this review, new users may navigate to Memopal’s Press Kit page to read its 34 page detailed guide. 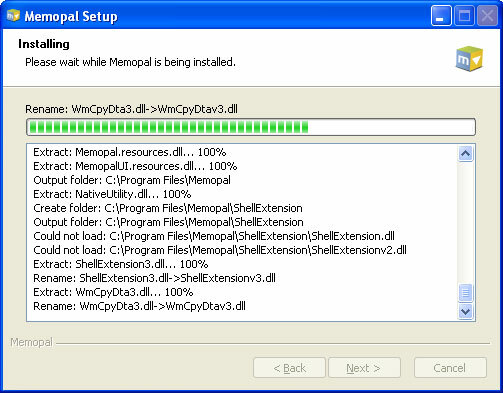 To begin the installation of Memopal, visit http://www.memopal.com/en/download-memopal.htm. 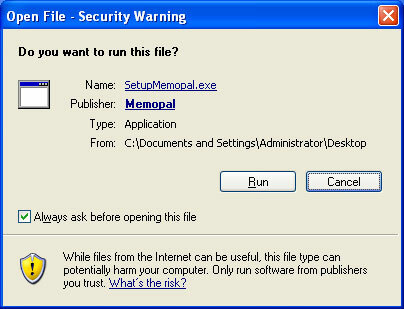 Memopal will intuitively recognize the client operating system and download the appropriate exe file for installation. The user can also manually select the operating system for which he requires the memopal download. The selected.exe file can be saved on to the PC and installed later. The user commencing the installation will have to select “run” to initiate the installation. The installation begins with the selection of the language. We have selected English for illustration. 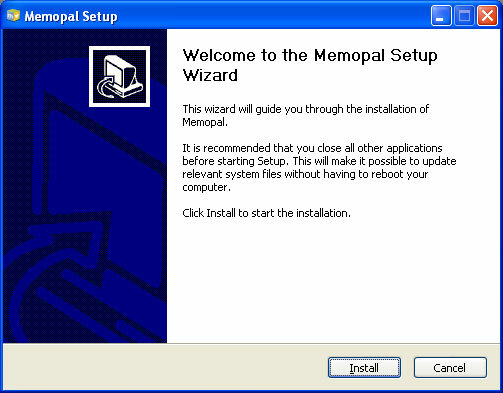 The next screen of the installation wizard is the welcome screen. 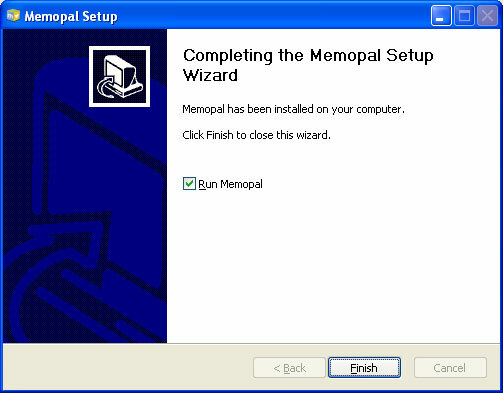 Clicking Next on this screen will initiate the actual installation of Memopal on the system. The next screen is a progress bar that asks you to wait while the installation is in progress. This takes less than a minute and the finish screen pops up before the user. If “Run Memopal” is checked (default) when clicking “Finish”, Memopal will be launched. As part of the installation, Memopal creates the directory Memopal under C:\Program Files, depending on the language selected in the client platform. 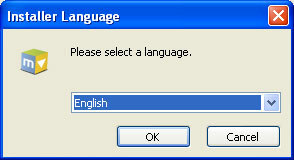 The user is now prompted to select the language again on the client interface. The next screen asks the user to input the user name and password for creating the Memopal account. Users who have tried the product and are eager to buy it, can sign up for the activation key by selecting “I am already signed up” or “the sign me up with my activation key” on the Client interface. This will open up the Memopal site and prompt you to buy the product and use their payment gateway for obtaining the activation key. Once the key is obtained, the same can be entered into the client side interface for getting access to Memopal for a month. If you choose to go with the free trial, the configuration screen will open prompting you to configure the client side user interface. The next screen prompts the user to select the backup configuration. This configuration can be changed at a later date. Users can choose to backup “My Documents“, a “Single Folder“, the “Entire System” or select “Custom” options. If “My Documents” is selected, the files and folders on the desktop, documents and settings, the folders containing outlook mail and folders containing application data will be backed up. The “Single Folder” option can be used to backup a single folder. The “Entire System” option can be used to backup system folders apart from everything else on the system. “Custom” backup will backup files and folders specified by the user. An “Advanced” button at the bottom of the radio buttons takes the user to a screen, where the user can create hotkeys for Windows; specify the timeout for the connection; the computer name; Proxy username and password if any; the methodology for handling locked files and the types of backups that can be created. This ends the configuration process and Memopal begins to crawl through the files that have been identified for backup. When the backup was interrupted deliberately, the same was suspended and users were assured that the backup would resume the moment the connection is restored. The assurance was honored and the backup resumed as soon as the connectivity was restored. The next backup would be an incremental backup as only files and folders that are changed or added will be backed up. Sometimes users may like to backup a single folder as a one time upload. Memopal allows such uploads but will not mark such folders or files for update at a later date when all other files and folders are being updated. Such an upload can be initiated by right clicking on the file or folder and selecting Memopal >> upload Now. Logs, tips, reports and statistics on backup can be accessed at any time by accessing the options button on the control panel. The backup status can also be checked in the status log window. Users can set the backup speed with respect to the line speed and the percentage of CPU usage that they want to assign to Memopal using the “throttle” control that is available on the control panel. Data security and disaster recovery is still top priority with Memopal. The secure Memopal Global File System is designed to ensure security of data. The data is backed up into three geographically dispersed servers simultaneously. The redundancy is built in to ensure that manmade or natural disasters do not jeopardize data in any manner and that data is recoverable at all costs. Special encryption algorithms have been developed to encrypt data during transmission and storage. An algorithm known as Turbo Upload have been created to break up large files into segments for ease of upload. The parts of files, which are identical are backed up once and referenced several times to reduce workload. The parts are then encrypted with different encryption protocols and uploaded into different servers so that hackers cannot get the complete information from a single server. The protection system is also not built into the software but resides in the servers into which the different parts of the file are uploaded. Files and folders that have been backed up into Memopal can be searched using the search facility that has been built into the application. This cloud search system has a web interface that provides access to files without having to specify the path of the file. The results are displayed on the basis of a prioritization of files that has been done on the basis of frequency of access of the file or folder, important file extensions and the level of proximity of the file to the storage path. The search is very fast and files and folders are displayed in less than 50 milliseconds with a preview of the document or the video. If users want to access the files and folders backed up from another machine using a web browser, they will need to login using the login box available at the website of Memopal. Users can then use the search tool to locate their files. The file can then be opened, by clicking on it or it can be saved to the PC. Clicking on the link that displays the number of modifications enables users open a previous version of the file. The Memopal File System Manager is a web interface for managing files and folders backed up into the backup server from different computers on which the Memopal client has been installed. The interface has three tabs-Search, Browse and Status. While Search allows you to search for specific files and displays them on the tab panel, browse allows you to browse a specific computer or a network of computers on which Memopal has been installed. A file can be deleted from Memopal backup repository, by searching for the file or navigating to the file and clicking on the down arrow on the top right of the file icon and selecting delete. 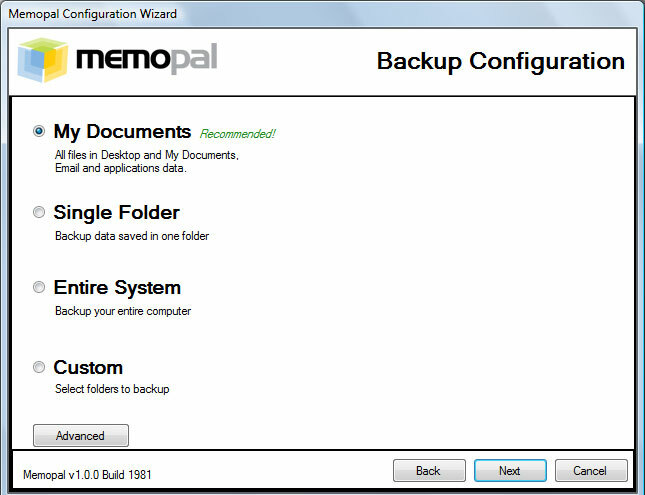 Entire directories can also be deleted from Memopal backup via the Memopal DAV interface. The client key will be required for this purpose. Memopal will also ask the user to enter the user name and password. Once the access is obtained, the file can be deleted as if the user is deleting a file or folder from the local hard drive. The files, once deleted, will disappear from the backup and cannot be restored. So, the deletion has to be carefully attempted. 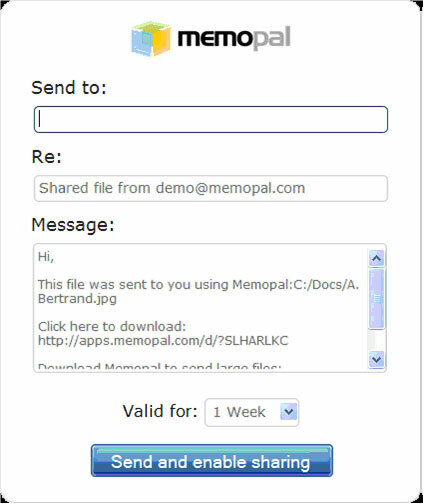 File sharing is made possible in Memopal. Users can send emails to friends with a link. Friends can then use the link to access and share the file from the backup repository on Memopal. Alternately, a file can be selected and shared by right clicking on it, selecting share and specifying the individuals with whom the file is to be shared. The period for which the sharing is valid can also be specified. Files that are not yet uploaded to Memopal can also be shared. 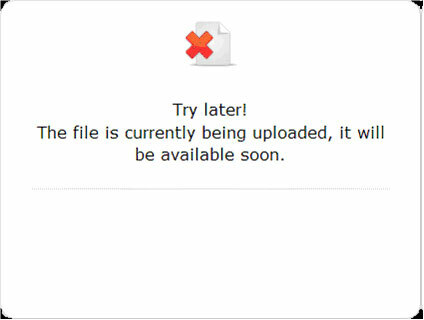 The person requested to share the file will be allowed access to the file only when the uploading of the file is complete. Files and folders can be recovered from Memopal using the DAV interface only. 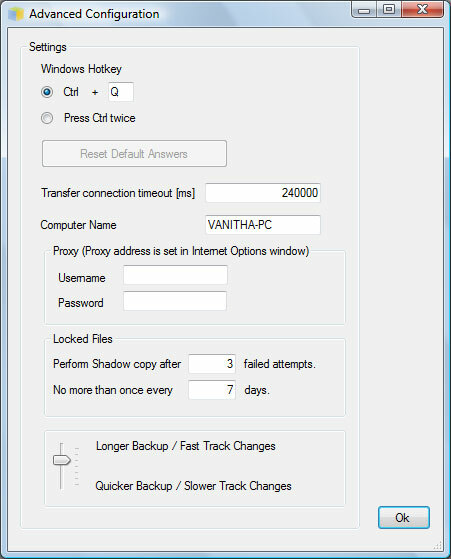 Once access is obtained by entering the user name and password, simple drag and drop can be used to recover a file to the desktop or folder of the user’s choice. Entire directories can also be recovered in this manner. The speed of recovery will depend on the Internet connectivity and the size of the file being recovered. Memopal is gaining popularity with users for its advanced cloud computing features and its disaster recovery strategies. It minimizes CPU usage during backup and transfers computing to the server. The files can be indexed, searched and accessed even as they are being transmitted to the online backup server. File backup, file search, logs and reports are added attractions of this application. Memopal has published an elaborate 34 page user manual that can be downloaded from the company website by clicking here. This user manual is very useful for users of Memopal’s services. MemoPal is available in eleven different languages and suitable for widely used operating systems (Windows, Mac and Linux). You can use Memopal to backup and access your documents. You can access your files at home, at your office and share your files among friends and colleagues. MemoPal is configured to work on several machines using one single license, even via Mobile phones. Memopal is entirely scalable, reliable and robust. It is easily affordable by individuals, small and medium size businesses or large enterprises. Some companies in Europe and USA have branded Memopal as their own offerings. Others have installed Memopal’s online backup enterprise solutions inside their company datacenter as a personalized online backup and document sharing as intranet. Memopal is highly recommended online backup solution; it is definitively the bridge between Online Backup, Remote Storage and File Sharing. I am a user of Memopal for almost a year now. The backup process is quite good. The main issue is the restore – while restore works OK from web interface even for large files (tested 1GB+ files), it is not consistently stable with DAV (on SAME machine with same T1 stable connection), which makes it IMPOSSIBLE to restore whole folders. Been using Memopal for less than a week. I was sitting on the fence as to which provider to go with, until Memopal offered a 30% discount. I like their simplicity and especially their search feature. I use Dropbox as my primary means of backing up my most critical files and having them syncronized. But I was on the free account and so was limited to 2Gb. I read too many negative comments about Carbonite and I use to use Mozy before they were bought out. I found Mozy would crash too often and made me nervous about how it was affecting my pc. So far Memopal looks very promising and with their recent promotion, they might be a steal. I think Memopal was the cause of my computer being sluggish. I run a Windows 7 RC on my Dell xps m1530 and it was running smoothly. I try the browse file feature in Memopal and everything became sluggish. My firefox browser and my windows explorer became sluggish. I am not 100% sure it is due t Memopal, but the circumstancial evidence is there. I am not sure what WebDav is but, I wonder if that is a possible source of this slow down. I will update this condition in the future. But my impression of Memopal has taken a nose dive if their software is responsible for fouling up my previously wonderful Windows 7 experience. I’ve been using the service for less than a month and liked a lot, but did not tested a full recovery yet ! I’ve downloaded the iPhone App client too, but in my opinion is very poor ! I recommend the mobile version of the web site through Safari web browser ! (iPhone). It’s far away better than the App. After I have installed the demo version, my PC starts to go slower. I have tried some other services but that’s not one of the best. Criptography, at the end, is made on server… How can I be sure that my files are cyphered on the server? My vote is 2 out of 5.